I just want to note that there's really too much going on for me to get into ALL the changes in every section in this post, but I'm going to highlight what I think are the best and most useful ones you should be getting excited about. If you saw the layout above, perhaps you noticed the "Add Additional Operation" button under Auctioning. This means you can have more than one operation per group for Auctioning. An operation would be something like (simplified) Sell 4 stacks of 5 at market value. Another operation would be Sell 5 stacks of 20 at market value. Did you get what I just implied!? Yes, you can now sell items in different stack sizes using TSM! This is one of my favorite additional functionality so far. What it will do is consider operation 1 first (so it'll sell 4 stacks of 5), and then if you have any left over it'll consider operation 2 (selling 5 stacks of 20), a great addition for those items you want to sell in multiple stack sizes, or offer bulk discounts on. Yes, custom pricing equations have been added to TSM! TSM now supports the following mathematical operations: %,+,-,*,/. Basic. Math. Yes you can now set fallbacks (now referred to as "Normal" price) or minimums such as: dbmarket + 100g, (crafting - 5g) * 2, or whatever your heart desires. You can also use functions such as minimum, maximum, or pricing of other items. This is a great and fun addition to play around with. There is a TSM 2.0 wiki page for Custom Pricing here, check it out to learnmore about what you can do with it, it's really awesome. I'm sure we're going to see a lot of ideas coming out when the addon is released, and I look forward to all the creative uses. Posting a group with glyphs in it? TSM will know to search for "Glyph of" rather than each individual glyph name, and not waste your time. Unlike in TSM 1.x, you don't have to set a Common Search Term, TSM does it for you. It optimizes the groups based on how many pages are searched if you do the items individually (assuming 1 page per item) vs. how many pages the entire search would be overall. TSM thinks hard, so you don't have to! In this example I'm choosing to only queue a sub-group of Jewelcrafting, named Primal Crafts (the Primal Diamond cuts I do). I really love this added feature, as well as the ability to queue for multiple toons from any character. If only it'd log each character for you and click the craft button for each craft! So what I can do with my subgrouping above is set up individualized Operations for both 'Glyphs' and 'Mysterious Fortune Cards' for ALL the different types of Operations (Auctioning, Crafting, etc.) that override any Operations I have for the 'Crafts' group. The override of Operations works the way that they work in groups now, so it'll be intuitive once you actually dig into it. Here is shown me crafting 724 Ink of Dreams, and in the bottom corner a timer, saying it will take 24 mins 7 seconds to complete my crafting, YIKES! Luckily I'm crafting in the background while I write this so I'm not wasting all that time. A couple new features of note on the front page: on the top you have all the gold in the current batch of 50 items, and on the bottom you have a button to just collect gold instead of open all. The button "TSM Groups" is just your mass mailing from TSM 1.x, but now you can select which groups you want to send before sending them out. The Quick Send is where things get interesting. So you drag an item into the box, in this example Starlight Ink, then select a character target and max quantity to send. Then you can enter a COD Amount per Item (or leave it blank to just mass mail to an alt), and hit the Send button and off it goes. This is a really great addition for anyone who is CODing regularly. 'Mail Disenchantables' will send all the Greens in your bags to the Player you specify (your enchanter hopefully). 'Send Excess Gold to Banker' will send all your gold over your Limit to a player you specify. So say you want to keep 200k on your current toon that has 350k. Put 200000 into the box, and the toon name you want to send to, and it'll send 150k to that toon, to put you at 200k. Target Player - The target player to send to for this rule. Keep Quantity - The number to keep on your character you're sending from. Set Max Quantity - If you don't want to send it all, set a number to send each time. Restock Target to Max Quantity - If target player has 4 and you set Max to 10, it will send only 6 instead of 10 each time you use the Operation. Include Guild Bank in Restock - takes guild bank into consideration in above calculation. From my usage so far Shopping is still (relatively) Shopping, although there are some subtle changes. I'm not going to go over them here because it's not particularly interesting, and this is getting long! Ignore my messy groups, but the focus here are the Buttons on the bottom. Move Group To Bank - This will move all of what you have of this group in your bags to your bank, in my example, all my crafted gems. It's useful if you want the bag space for when you're not posting. Move Post Cap to Bags - This will move how many you have set to post into your bags. For example I post gems in 4 stacks of 1, so it would move 4 from the bank into my bags. Nothing more nothing less. Nifty! Move AH Shortfall To Bags - This one gets really thoughtful. Say your auctions expired and you sold only 2 of a gem from the 4 you posted. This button will put 2 in your bags, even if you haven't retrieved the other 2 from the mailbox yet. Move Group to Bags - This will of course move the entire group from your bank to bags, ie all your gems or all your tailoring crafted etc. So that's about it for the Operation modules, but it's just the tip of the iceberg, just a few more additional features to cover before I finally sign off here. The cool additions are Expired Since Last Sale and Sale Rate. This really gets you an idea of what your hot sellers are. The Sale Rate = total sold / (total sold + total expired + total canceled), you'll want this number as close to 1 as possible! Very interesting stuff to play around with, can't wait until I have more data! Last but not least in Accounting there's a new tab that graphs changes in character gold, mine looks a little wonky because I've been buying in bulk from a supplier on this toon since I got 2.0. Last but not least, TSM has added a great functionality to change pricing for mats across all professions. 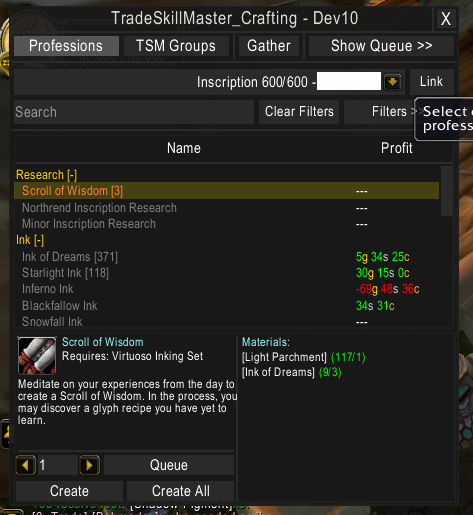 In TSM 1.x, if you wanted to change the price of a Wild Jade you would have to do it in JC and in Alchemy separately. For example I liked to use .95*golden-lotus in my calculations previously for rare cuts, and I had to add it to JC and Alch separately. Now I can use (Golden Lotus + 5g)/1.2 as the price source, and only have to change it once. Well that just about wraps it up for my 2.0 teaser. There's a lot to learn, but I'm sure from reading all this you can see the added awesomeness to come. Hope you're excited as I am for this new addon! You can find TSM on the TSM Website or TSM Forums. Also, if you enjoy the addon, consider donating via their website! WoW!!! That's a huge post!! I haven't read it completely but I should, so I can see if I've missed something. I haven't completely gone through everything TSM 2.0 has to offer. Thanks Phat. Been out of it this week. I feel caught up now. I do have a question though. I know you said that you don't want to get into shopping, but 1 issue that I've alway had with TSM is that when you run a scan you don't get results of auctions with no buyouts. Does TSM 2 give you results of auctions without a buyout? My main market is x-mog and there can be a lot of really good deals out there without a buyout. Here's the one thing that will determine whether I use this for posting auctions or whether it's still necessary for me to do it semi-manually with Auctionator: When posting at multiple stack sizes, can it be configured to undercut the cheapest auction *of the same size stack* rather than simply undercutting the cheapest of any stack. In other words, if the cheapest stack of 5 has a unit price of 50g each and the cheapest individual is 40g, can I get it to post stacks of 5 at 49.999 instead of 39.99. Without this functionality, TSM just can't do what I need it to be able to do. You'll be happy to hear that it does indeed have this functionality! I've been using it a lot, had some bugs at the get go, but the kinks are being worked out. Already fixed and working fine! If you could do a post focusing on more crafting details I would really appreciate it. Use the gather button on your profession window once you've queued your items. Hehe sorry I should've been more clear and was kind of vague on that. I meant for Glyphs. To cut down on mail retrieval and listing times, I only post 1-2 glyphs at a time and I keep a huge inventory in my banks. Everything's posted from a bank alt. I was wondering if there's a way to create operations that can retrieve any glyphs from my bank that I don't have listed on the AH. And TYVM for the speedy reply! There's an option to grab shortfall from AH and this should cover it. I work by class using macros similar to those found in section 4.0 of this guide on Stormspire.